Our household has a bad case of the Mondays. This weekend went by way too fast! It was a productive one for us though! On Sunday, Ruby celebrated her 3rd birthday, which meant we spoiled her more than usual. We took her to the dog park and she was absolutely exhausted by the time we got home. 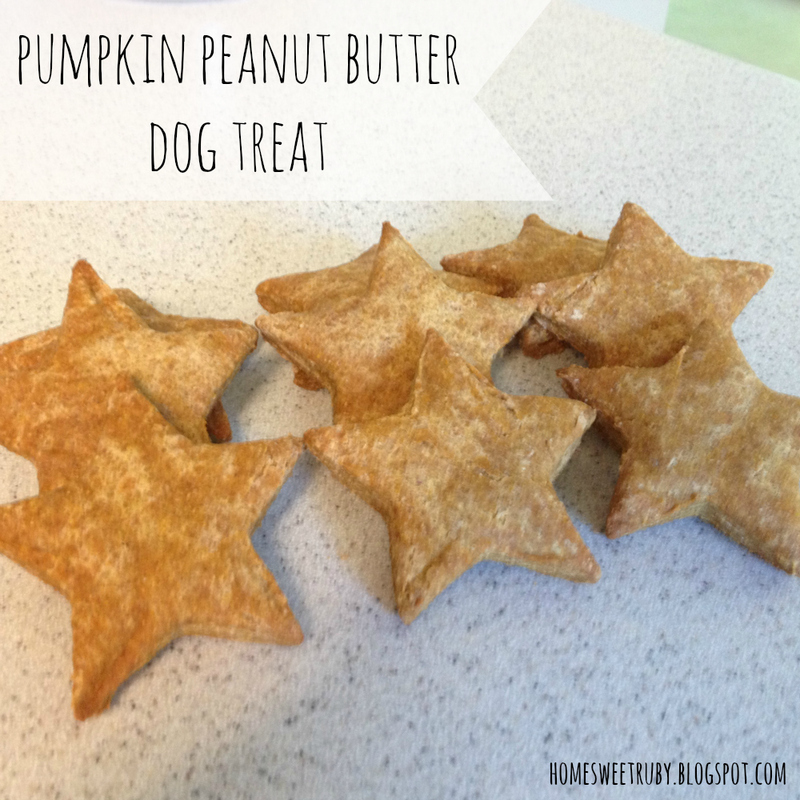 In honor of her birthday, I baked her some homemade pumpkin peanut butter dog treats using this recipe. I adapted it slightly to make the treats a little softer than most dog biscuits and Ruby loves them! Step 2: Mix all of the ingredients together, including the water which is not shown in the picture. You may want to just use your hands after a while because its easier. The dough will be more stiff and dry than your typical cookie dough. Step 3: Roll out your dough in between two pieces of parchment paper. If you don't use the parchment paper, you will have a sticky mess on your hands and on the counter. You can roll the dough as thin or as thick as you'd like, but it shouldn't be more than a half inch thick. I made them thinner the second time I rolled out the dough which I think is better for a little dog like Ruby. Step 4: Cut dough using any cookie cutter. I chose a star because it is a little smaller than other cookie cutters. One of these days I'll remember to get a bone-shaped cookie cutter! Step 5: Using parchment paper over your cookie sheet, bake for about 35 minutes or until the bottoms begin to darken. As the treats cool, they will firm up a little more. As you can see, this dog treat recipe is really easy, requires only a few ingredients which you may already have in your kitchen, and its healthy for your pup.